Displays amusing quotation in Login Window. Is there a better alternative to iQuip? Is iQuip really the best app in Desktop category? Will iQuip work good on macOS 10.13.4? 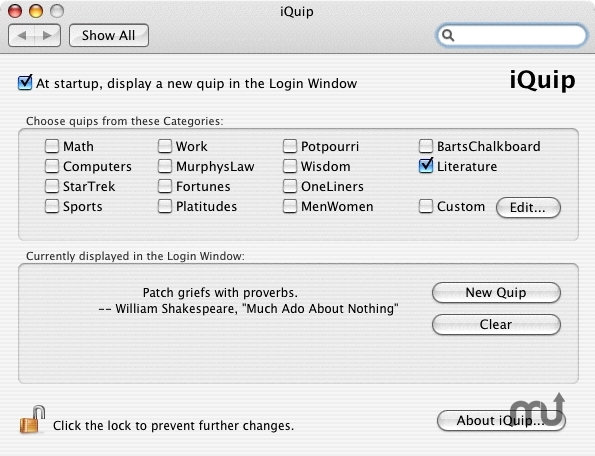 iQuip displays a new amusing quotation in the Login Window every time you start up your Mac. With an easy-to-use preference pane, you can select from a variety of categories containing thousands of quotations. You can also enter your own quotations to be displayed, or use any of the hundreds of Unix 'fortune' files which are available on the internet. iQuip has a tiny footprint and does not run any background processes on your system. iQuip needs a rating. Be the first to rate this app and get the discussion started!